I read the book Smile. The author's name is Raina Telgemeier. It is about this girl named Raina. She was was with some girls running to her house and fell down and knocked her 2 front teeth out. She gets braces later on in the book. And she has a crush on someone in the book. If you want to get more info read the book. For anybody who likes mystery books this is the right book for you. It’s not too hard it’s not too easy it’s just right. 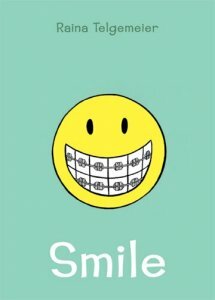 If you want to find out what happened to Raina Telgemeier read this book to find out what happened to her 2 front teeth. Raina Telgemeier I give your book 5 STARS. Your book is so fantastic I didn’t want to put the book down. That really happened to you when you were in sixth grade? I feel sorry for you if that happened to you Raina. A graphic novel about friends, family, boys, girls, and major dental drama! 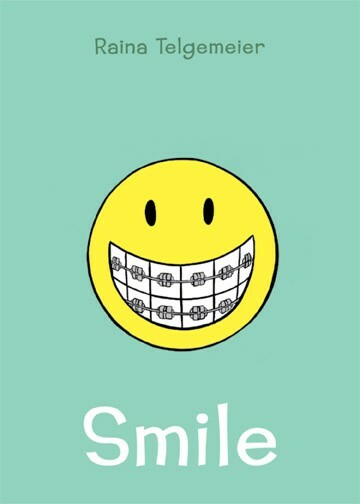 Autobiography in comic style – with braces! When Raina knocks out her 2 front teeth in sixth grade, getting braces doesn’t seem so bad. But her teeth won’t reset right, so it’s on to root canal surgery and a retainer with false front teeth and headgear to wear at night! Getting her ears pierced for her birthday makes things a little better; having a bratty little sister who teases her… well, Amara’s always like that. Seventh grade gets interesting, with cute boys and the big San Francisco earthquake of 1989 and more dental surgery (braces and headgear – again!). Raina wonders why some friends don’t stay friendly and why some boys aren’t friendly enough. She decides to try out for the basketball team in eighth grade (teeth-moving still in progress), enjoys being a Girl Scout camp counselor in the summer, and worries about going to high school. This book is a deep,emotional, yet, fun, book. Although that is biased, because i love the author's books and novels. I love this book and i love all books. This Book is great its funny and creative and rules and you should read the Wonder book to.